After a great night's sleep and a good lie in with Morse (book 2), I set off on the calm sunny morning past a large herd of deer and lots of birds including a curlew, to pick up a track at some shielings. 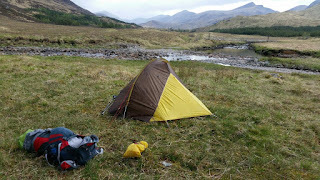 This took me down past the bunkhouse at Boreland to Fearnan, beside Loch Tay. The loch is long and narrow - around 14 miles long, and typically around 1 to 1½ miles wide. It is the sixth-largest loch in Scotland by area and over 150 metres deep at its deepest. My plan to take a forest path a good couple of hundred metres above the Loch was thwarted by a 'Private No Admittance' sign, but less than ten minutes further on a more encouraging sign - 'Tay Forest Park - The Letterellan Gate' - indicated a more pleasing route through the forest above the main road. The path was a grassy carpet laced with bugle and a neat yellow flower that may be yellow pimpernel. There was also lots of wood sorrel, greater stitchwort, violets, primroses and strawberry flowers. To my right, the woodland between the path and the road was a dark blue sea of bluebells. After just over two km of pleasant strolling the path ended in a clearing. It's marked on the map as rejoining the road, and the overgrown remnants of that blocked route are still evident. So a 'forest excursion' was required over ground piled high with dead branches in order to regain the road. 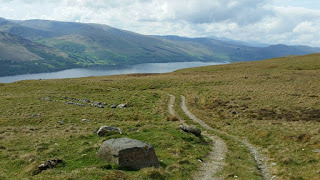 A little further on, a path marked 'Short Walk to Kenmore' delivered what it promised. A delightful path through woodland, with broom, eyebright, garlic mustard and herb robert adding to an ever growing list. Before we leave the pretty village of Kenmore, here's a bit about it. The village dates from the 16th century. It and the neighbouring Castle were originally known as Balloch (from Gaelic bealach, 'pass'). The original village was sited on the north side of the river approximately two miles from its present site and was known as Inchadney. In 1540 Sir Colin Campbell of Glenorchy started the construction of Balloch castle on the opposite bank of the river and the entire village was moved to a prominent headland by the shores of Loch Tay, hence the name Kenmore, which translates from Scots Gaelic to "big (or large) head". The village as it is seen today is a model village laid out by 3rd Earl of Breadalbane in 1760. 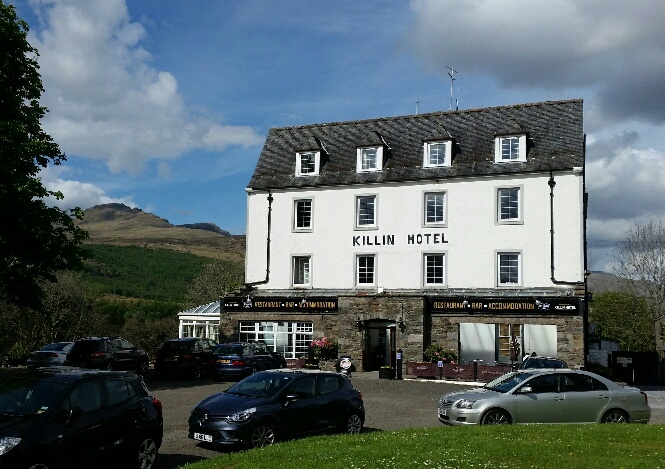 The Kenmore Hotel, commissioned in 1572 by the then laird Colin Campbell, has its origins in a tavern built around 70 years earlier offering accommodation and refreshments. It is reputed to be Scotland's oldest hotel. It looks quite posh. Taymouth Castle, another Campbell creation, was built by John Campbell, 2nd Marquess of Breadalbane, on the site of its late medieval predecessor, Balloch Castle (built 1550 by the Campbells of Glenorchy, ancestors of the Marquesses of Breadalbane, demolished 1805). This enormous mansion, in neo-Gothic style, was completed in time for the visit of Queen Victoria in 1842. No expense was spared on the interior, which was decorated with the utmost sumptuousness. Taymouth Castle is now privately owned and has a fine golf course in its grounds. Plans to restore the Castle to its mid-19th century glory and convert it into a luxury hotel are said to be currently ongoing. Kenmore Bridge dates from 1774. Around two miles northeast of the village by the side of the A827 road is a complex multi-phase stone circle known as Croft Moraig Stone Circle. The Crannogs of Loch Tay, artificially created islands of which there are 18 in the Loch, are thought to have originated before 2000 BC, though they continued to be built and used as dwellings and refuges into the Middle Ages. The Crannogs not only afforded excellent protection against unruly neighbours but protected the ancient Celts from the wild animals (wolves, lynxes and bears) that once inhabited Scotland. The biggest island in the Loch, known as the Isle of Loch Tay, or in Gaelic Eilean nam Ban-naomh, 'Isle of Holy Women', is just north of Kenmore. It was the site of a nunnery in the 12th century and was the burial place of Queen Sybilla (d. 1122), wife of Alexander I of Scotland (1107–24). A castle was built on the island in the later Middle Ages. Much larger in area than the other crannogs, it is unclear to what extent this island is natural, or has been 'improved' over the centuries. So now you know all about Kenmore. A pretty spot that I walked through and left via a good chat with a lady from Johannesburg, up a steep minor road for 4 km to this position overlooking a small lochan with Schiehallion dominant on the skyline. There's an unexpected variable signal here - maybe not enough to send this posting but enough to discover that Mike and Marian have, with only two good legs between them, had to drop out. That's a great shame. Meanwhile Di continues to struggle on with her one and a half feet. I hope she made it to Aberfeldy. Yesterday's pictures were self explanatory, the middle one showing the tricky descent from An Stuc. 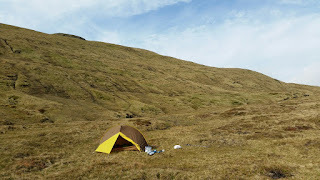 Today's pictures: striking camp in calm weather below Meall Greigh summit, Loch Tay from the descent path, lunch with Ngumo and Di, today's camp site with Schiehallion. What a fabulous mountain day. Despite a large party of cyclists ordering ahead of us, the Killin Hotel followed up last night's fine meal with a promptly served and we'll cooked breakfast. I was on the road by 8.45, and was soon passed by Sue as she drove up to the Ben Lawers car park. She was intending to go to a couple of summits then meet me on the way back. It was such a good day though that I tried to encourage her by text message to walk the entire ridge and hitch a lift back to her car. I'd planned a cross country route to the car park via a track near the top of a pipeline, but it soon became clear that access from below was a problem, at least for anyone lacking local knowledge. So rather than impale myself on a series of barbed wire fences, I chose to walk along the main road. Thankfully there was very little traffic. Much to my surprise, shortly before my turn up the minor road to Ben Lawers, I was accosted by a sign announcing 'coffee shop - open'. I was the only customer. A pleasant half hour was passed with the lady of the shop, mainly discussing the local wildlife, which is plentiful and varied. The Carpenters music had the edge on my earlier Ken Bruce experience. The bright yellow VW campervan that had been lovingly restored and the newish state of the art model looked resplendent (almost to the point of giving me ideas above my station!) as I pointed out the path to their paragliding occupants. Setting off at 11.15 up the Ben Lawers path saw me passing a few chatty folk and meeting the early morning brigade - the weather was blue sky earlier, now some clouds had arrived but it was still mostly sunny. 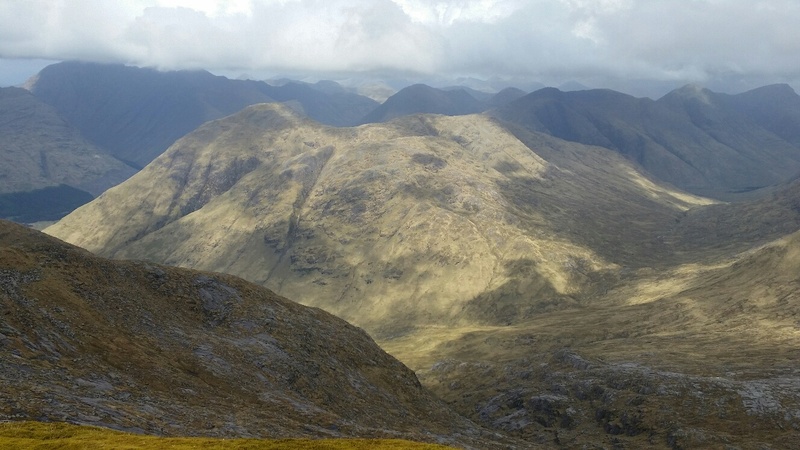 I climbed these Munros many years ago, certainly before 1997 when An Stuc was promoted to Munro status - I remember having to go back to the area to climb it. In those days there was a Visitor Centre and the path up Ben Lawers was diabolically eroded and boggy. What a transformation! The visitor centre has gone and the path is now a finely constructed mountain footpath over virtually the entire 10+ km ridge. Well done whoever accomplished that project. The Ben Lawers ridge now has five Munro summits, the descent from the middle of which, An Stuc, has a reputation for being a little tricky. I could see a group of four ahead of me and a chap I met confirmed that there were two Challengers (no doubt Graham Brookes and Andy Dawkins) the wife of a Challenger (no doubt Sue, following my advice and doing the whole ridge) and an unknown day walker. Meanwhile, I got to the last summit at five o'clock, spent a while there enjoying the views and the ambience, then descended for fifteen minutes to this lovely location. It's a short day tomorrow so I can have a lie in, but today's walk was rather easier than expected thanks to the excellent paths. Today was Glen Lochay day. I was off by 8.30 after another 'perfect pitch'. Very comfy indeed, and if I hadn't gone to sleep early I'd have enjoyed a good lie in. But with the sun on the tent I was starting to roast. Glen Lochay is a glen through which the River Lochay runs eastward towards Loch Tay, joining the River Dochart at Killin. 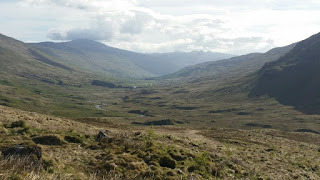 The glen is about 32 km long, running from a point north of Crianlarich to Loch Tay. Today I walked the last 23 of those kilometres. The river was very easy to cross this morning, by a clump of moss campion. I then followed the high track that passes Batavaime farm, the last occupied building in the glen. Continuing on to Kenknock Farm, beyond which there is no vehicular access unless your destination is the cottages at Badour, I could see two backpackers on the track below me. A startled sandpiper flew off. I stopped for a brew, observing the ruins of some cottages higher up the glen, but these were vacated long ago. There is an extensive local hydroelectric network throughout this area, much of which is buried under the ground and goes largely unseen, but some pipelines are visible crossing the glen. Just beyond the first of these I dropped down to join the lower track at Kenknock. I soon caught the two backpackers seen earlier, Charles (Ngumo) and Di, and spent a pleasant half hour chatting with them before moving on at a slightly quicker pace. Only slightly, I was feeling tired again and couldn't manage all of my tuna salad lunch. 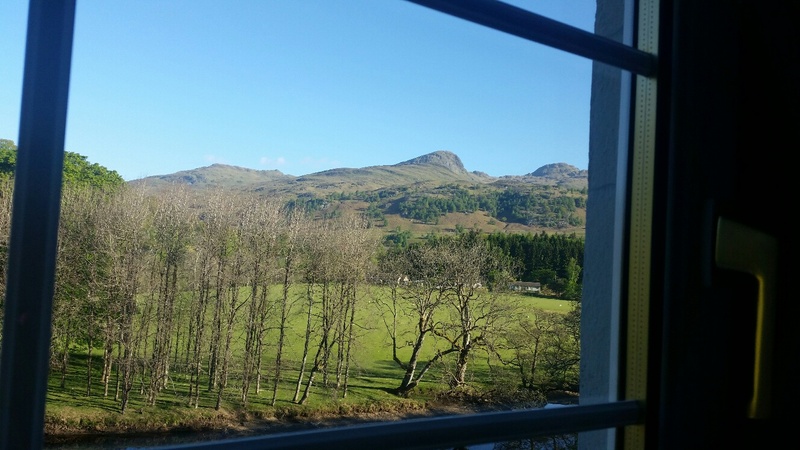 Luckily, today's 23 km were very easy, and I was installed in room 29 in the Killin Hotel by 2.30. Sadly no phone reception, so unable to contact either 'TGO control' or Sue. 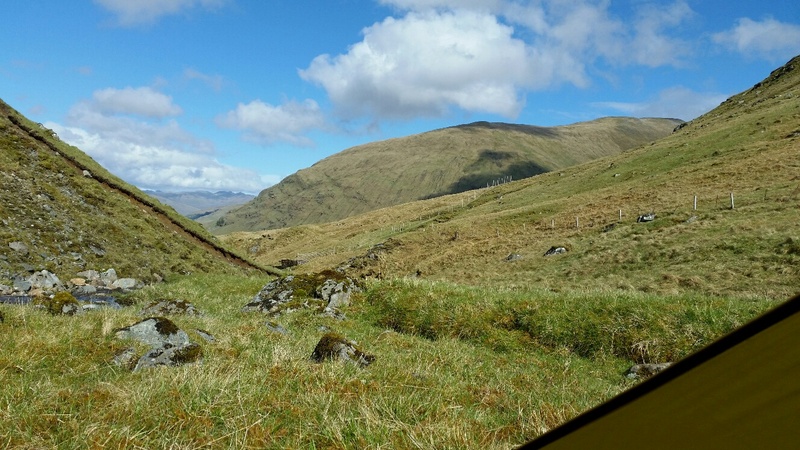 Today's pictures: The early morning view down Glen Lochay, looking back to Beinn Challuim from a brew stop, tonight's luxurious accommodation. The village of Killin ('the White [or Fair] Church' in Gaelic) is situated at the western head of Loch Tay. The west end of the village is magnificently sited around the scenic Falls of Dochart, the main street leading down towards the Loch at the confluence of the rivers Dochart and Lochay. The falls are crossed by a narrow, multi-arched stone bridge carrying the main A827 road into Killin. Killin railway station was on the Killin Railway. Sadly the railway station was officially closed on 1 November 1965.The MacNab Clan were once dominant here, and have long been associated with Killin. Their ancient burial ground is on Inchbuie in the River Dochart, just below the falls, and is visible from the bridge. Kinnell House was the seat of the MacNabs. A well-preserved prehistoric stone circle (possibly 'restored' to improve its appearance) known as Killin Stone Circle can be seen in the grounds of the house. To the north of the village lie the ruins of the Campbells of Breadalbane's stronghold of Finlarig Castle, with its associated chapel. The growing power of the Campbells eventually ousted the MacNabs, who lost Kinnell House to their rivals. In 1694 Sir John Campbell of Glenorchy, 1st Earl of Breadalbane, established Killin as a Burgh. In 1949 Kinnell House and its estate returned to the ownership of the Chief of Clan Macnab, but in 1978 death duties forced the then Chief, James Charles Macnab of Macnab, to sell most of the estate. By the end of the 18th century there was a local linen industry. Flax was grown locally, spun in small mills and woven into linen by home based weavers. Today, Killin services the local rural community and the growing tourism and leisure industries. In addition to walking on Ben Lawers National Nature Reserve, fishing for trout and salmon there are various watersports available on Loch Tay. Many local vernacular buildings have been preserved or converted, allowing the village to retain much of its historic character. The 19th century Moirlanich Longhouse in nearby Glen Lochay (on the road I didn't take) is a rare surviving example of the cruck frame Scottish longhouse, and is now in the care of the National Trust for Scotland. The former Breadalbane Folklore Centre in the Victorian mill by the falls displays the 'healing stones' of Saint Fillan. Tomnadashan Mine, an abandoned copper mine overlooking the village, is sometimes identified as the haunt of the Rabbit of Caerbannog of Monty Python and the Holy Grail fame. Finally, Glen Lochay is the mysterious location to which Richard Hannay, played by Robert Donat, heads in the 1935 Alfred Hitchcock film 'The 39 Steps'. I delayed my departure from Tyndrum as long as possible, finding excuses to faff with anything possible. By the time I left the cabin at 9.45, it had just about stopped raining. Waterproofs went on and off like a campervan's kettle for a couple of hours. 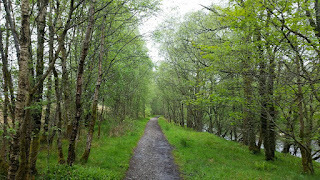 The path out of Tyndrum was more scenic and interesting than yesterday's. A bare area served as a reminder of the lead mining that took place here, desecrating the countryside. A pleasant woodland path then led to the Lochan of the Lost Sword, where Robert the Bruce and his army are reputed to have thrown their weapons, including Robert the Bruce's huge Claymore, after their defeat at the nearby battle of Dalrigh in 1306. No weapons have been found so the story is probably just a tourist attraction. The field of the Battle of Dalrigh was passed (a field of grass), soon after which I came across a sign down a side track 'Artisan Café 3 mins'. 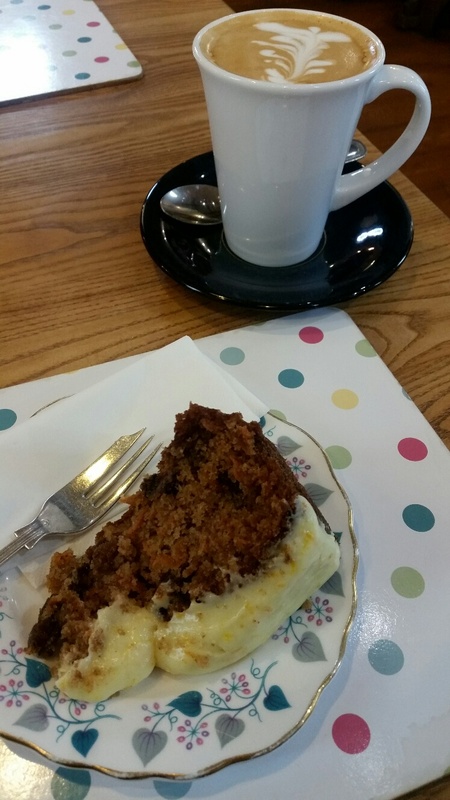 It took me five minutes, but the diversion was well worth it for the latte and carrot cake served in an old chapel with Ken Bruce's dulcet tones in the background. 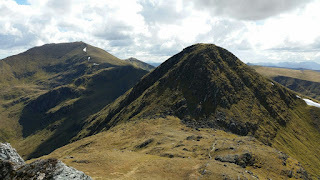 My excuse for eating more cake was founded on a plan to climb Beinn Challuim. 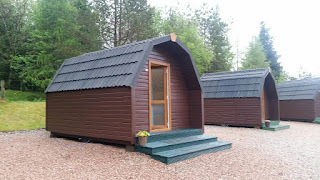 After meeting a few WHW walkers I passed through Auchtertyre, where Strathfillan Wigwams appear to be thriving. According to Aaron (Day 1) an en-suite wigwam is now available for around £20,000 should you want one. It's his dad's business. Just before Kirkton Farm the remains of St Fillan's Priory are represented by a disappointing pile of moss covered stones. My path left the WHW here and passed a couple of neatly maintained cemeteries before crossing the railway and embarking on the major ascent of the day. There were two walkers ahead of me, strangely carrying no rucksacks at all. I caught up with them. "Charles!" Yes, I'd found my first Challengers since parting with Aaron on day 1. Charles had taken both his and Di's bags further up the hill and had come back down to walk with her. He must be walking nearly three times as far as Di! 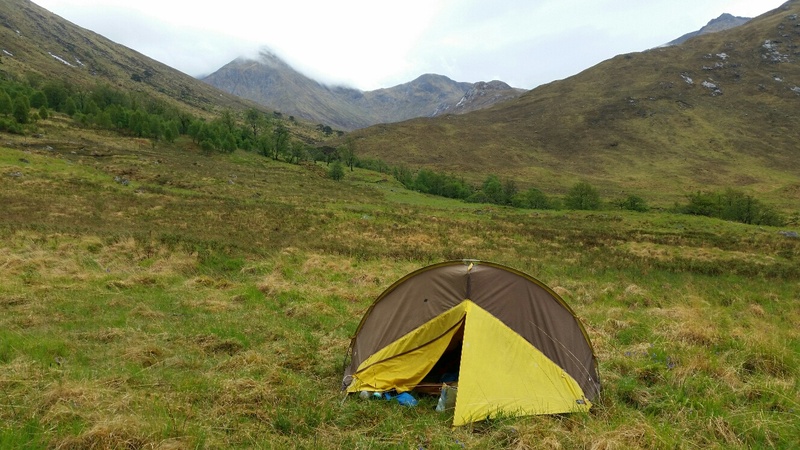 They were planning to contour around Beinn Challuim and head into Glen Lochay to camp. After a chat, I left them to it and headed on up the hill. Lunch was taken at 12.45 at about 500 metres. Conditions were vile - strong gusts of wind and a deluge of rain in a cloud with only a few metres visibility. If it's like this here, what will it be like at 1000 metres? I didn't bother to find out. This was where my FWA should kick in if needed, and I decided it was needed. The cloud soon cleared to just above my head and the contouring was relatively easy despite a few gullies, and complaints from my left foot concerning the stresses being placed on its left side due to contouring across a steep slope. Beinn Challuim is noted as a habitat of Northern Green Rush or Sedge, which may be rare. I wouldn't know it if I saw it, but I wonder whether a metal cage on the hillside might have anything to do with it. The bealach was attained and it was an easy, if pathless, walk beside the river to this excellent spot, where I arrived at 3.15. 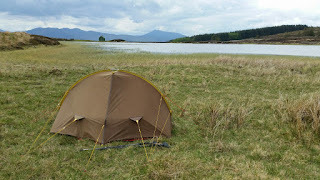 As I was pitching the tent the rain stopped and the sun came out, so I've had a pleasurable afternoon beside the babbling river with a good view of the nearby hills. I keep hearing 'voices' but it's just the river 'babbling'. During dinner (pasta sauce with tuna twists) a large military aircraft flew over, seemingly just a few feet above me. 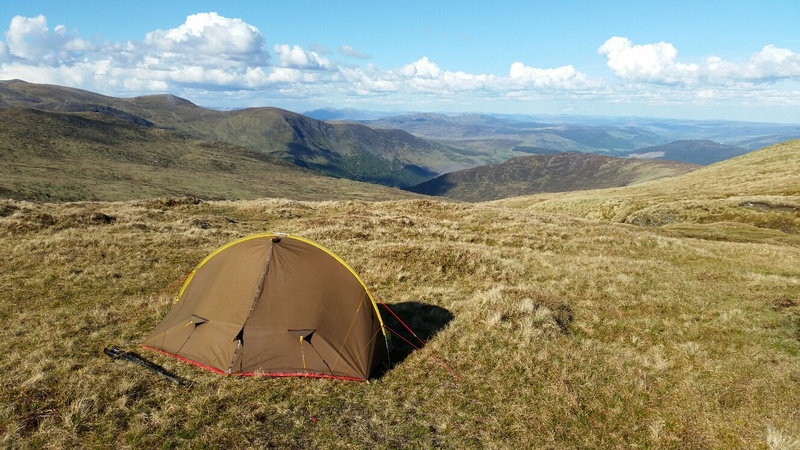 Today's pictures: an excuse for cake, typical WHW path, camp, view from tent to Meall Glas. It was 9.30 before I set off across Clashgour suspension bridge on the good path that was to be a feature of the day. 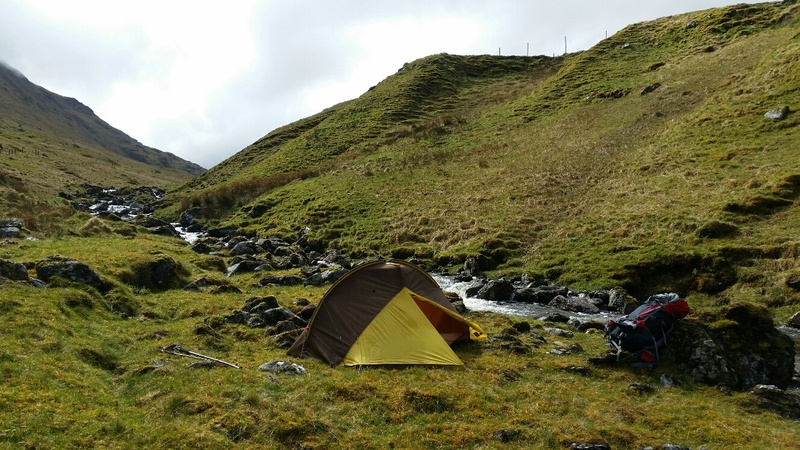 I'd been lulled to sleep by the drumming of raindrops on Goretex, and and I woke, late, to the same sound. I'd have heard it all day if I'd stayed in the tent. 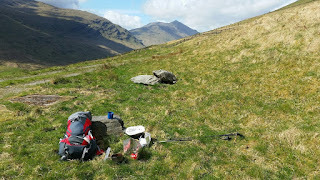 After just over half an hour I passed Clashgour hut, the last landmark on yesterday's planned route. The hut was originally built c.1900 but had to be rebuilt in 1919 following a fire. Its construction is of the Meccano type kit, typical of temporary structures of the period. Until 1933 it was used as a four pupil primary school, but this ended with the opening of the new road to Glencoe. For several years it remained unused and it deteriorated until the GUM club Glasgow University Mountaineering Club took it over in 1948 when the Blackmount estate agreed to lease it. This arrangement still continues today. The hut has changed since then, with the main change being the building of an upper level for sleeping. Legend has it that the hut once held 35 people after two groups of walkers were forced to return there from a wild day on the Blackmount Hills. I'd seen smoke from the chimney, and glancing back to the hut I perceived a young lady signalling at me - 'T'. I introduced myself as 'Conrad', out of deference to the great man who receives frequent offers of this nature. The tea was excellent, provided by four non members of the club who had paid £3 for the privilege of spending a night in this iconic place. I have no idea how it could accommodate 35 - it seemed full with five. 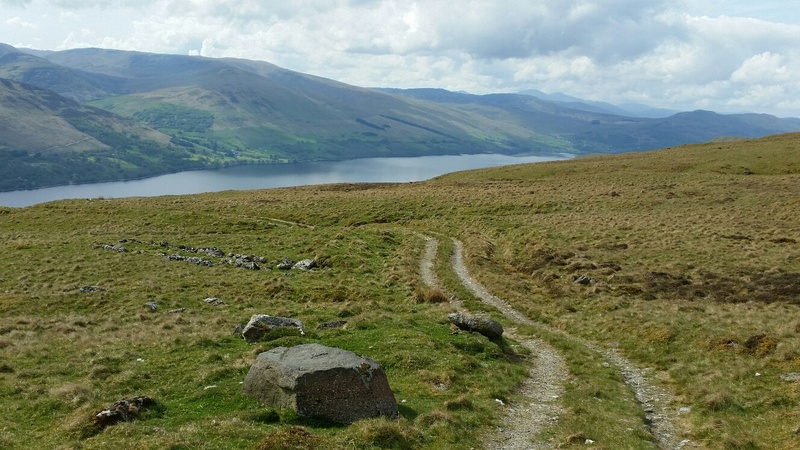 The WHW is a linear long distance footpath, with the official status of Long Distance Route. The 154 km route runs from Milngavie north of Glasgow to Fort William. I'm informed that about 80,000 people use the path every year, of whom over 15,000 walk the entire route. I met about 100 people today who appeared to be on the WHW. 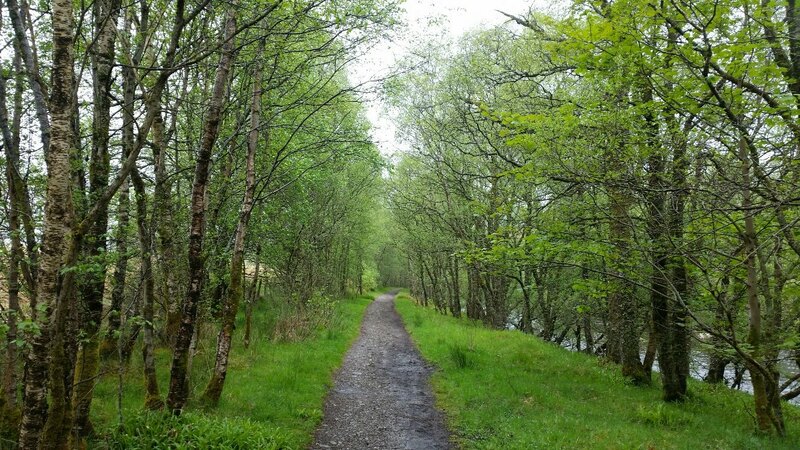 The trail was conceived by the late Tom Hunter, approved for development in 1974, and completed and opened on 6 October 1980, so becoming the first officially designated long distance footpath in Scotland. In June 2010, it was co-designated as part of the International Appalachian Trail!! I was on my way again on the good path to Bridge of Orchy, still in rain (it rained all day). A girl wearing flip flops passed in the other direction (I saw nobody else heading south) - her smile was as broad as the path, which was lined with bright yellow kidney vetch. At Bridge of Orchy, a village that dates back to 1751, a 66 reg campervan pulled up. Alas not Gayle, but a chatty couple nontheless. 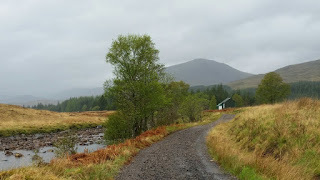 The eponymous bridge at Bridge of Orchy was constructed by Government forces as part of a programme of pacification of the Highland Clans which involved the construction of military roads from the Lowlands into the much wilder upland areas of Scotland. It crosses the River Orchy, one of the finest white-water rivers in the UK. The hotel provided me with a vast pot of tea and a bowl of Cullen Skink. The diners were of WHW genre - no sign of another Challenger. So, onward to Tyndrum, with the rain being blown into my face by what little wind there was. Many more bedraggled folk on the WHW. The track has improved somewhat from the bogfest I recall from walking along here many years ago, and the coconut smell of the bright yellow gorse was delightful. After an uneventful two and a bit hours I reached Tyndrum, a small village notable mainly for being at a junction of transport routes. 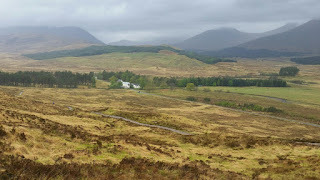 The West Highland Line railway from Glasgow splits here, with one branch heading to Fort William and the other to Oban. Tyndrum has a station on each: Upper Tyndrum on the Fort William line and Tyndrum Lower on the Oban line. Thus unusually there are two stations serving the same small village, only a few hundred yards apart, but about 10 miles apart by rail. It's no surprise then that Tyndrum is the smallest settlement in the UK with more than one railway station. 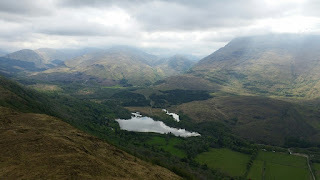 Overshadowed by Ben Lui, (not today - the cloud saw to that) Tyndrum is built over the battlefield where Clan MacDougall defeated Robert the Bruce in AD 1306, and took from him the Brooch of Lorn. So by 4 o'clock I was installed in my cabin. Ablutions took some time, then a chicken burger at the Real Food Café. Very ordinary but the beer was welcome. No sign of any other Challengers - I'm probably looking in the wrong place. Anyway, I'm enjoying Ruth Hogan's 'The Keeper of Lost Things'. 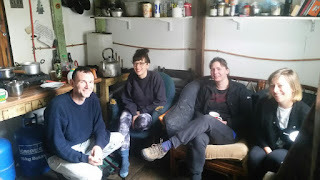 Today's pictures: inside and outside the GUMC hut, the view back to Inveroran, and 'Islay' - my luxury cabin. Today's timepiece free start saw me leaving camp in reasonable weather at 8.15. So I must have got up at about 7. I missed a bridge over the river that I thought I had to cross. The river would have been easily crossed yesterday, but overnight rain had made the ground spongy, if not really boggy, and the rivers tricky to cross. After getting across myself, I helped a guy who was going up Ben Starav. My route needed none of the three river crossings I made, and I later met folk who had changed their itinerary because they weren't able to cross. The crossings weren't that bad, and they did enable me to get a good view of the Robbers' Waterfall. 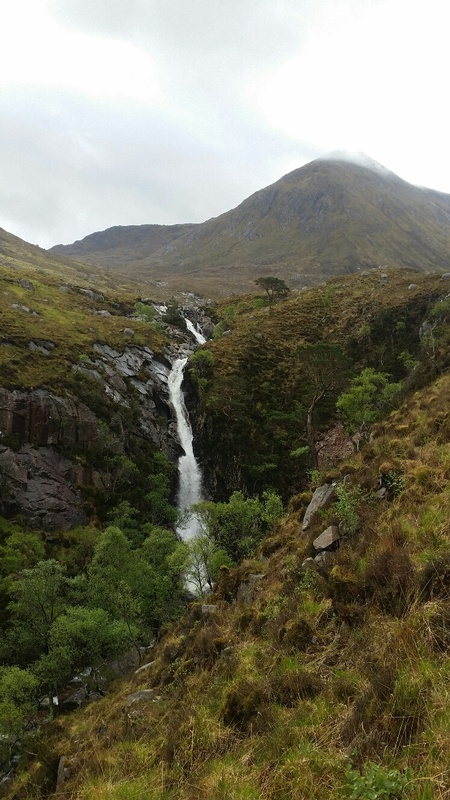 The Robbers' Waterfall, Eas nam Meirleach, is an idyllic waterfall hidden by the slopes of Ben Starav. The 15 metre double waterfall drops down a dark narrow ravine. It's hard to get a proper sight of it. I think I failed. It was rough going up to the 800 metre col, and fairly rough up the two Munros. But at least they were clear of cloud, if not the hailstorm that greeted me at the first summit. It was another rough descent through an area of bog laced with rivulets and full of butterwort and frogs, to join the Glen Kinglas path. A bit further up the valley some people were setting up tents. After the pathless descent, then a bit of an uphill slog to reach the track, suddenly walking was a whole lot easier. But I was getting tired. 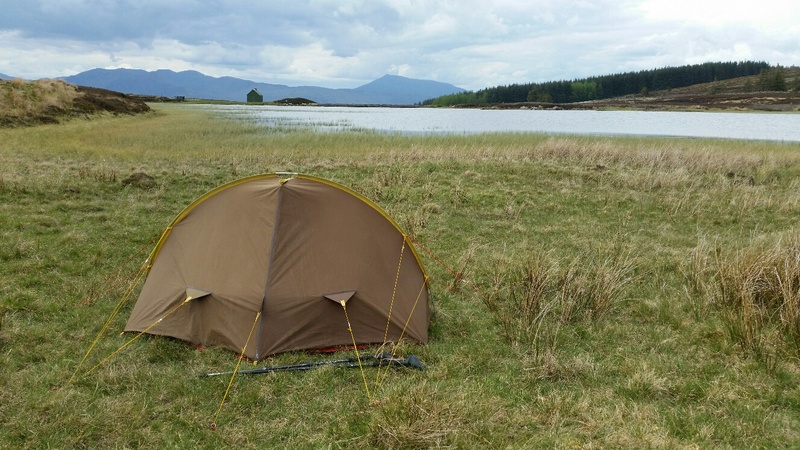 Loch Dochard looked a good place to camp beside, but a sign referring to rare ground nesting birds discouraged that. So I moved on to where Alan and Sheila would have been if Alan hadn't developed a tooth problem. It's a good spot. Very flat. 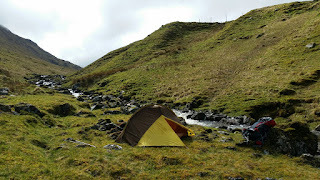 I got the tent up just before a heavy shower so it's a bit drier in here than it was last night. I've seen no Challengers to speak to today, though a group of three crossed the nearby bridge just as I was rushing to get the tent up at around 5.30. The pictures: waterfall, view from second Munro, and camp. Weather: warm and still; gradually clouding over with light rain starting at noon. Waterproofs needed by 2.30, then steadily increasing pulses of rain ended in heavy rain whilst tent was pitched. Midgy, hence not many stops. Rain stopped later. Not much Wiki today, you may be pleased to note. Yes Gibson, I was tired yesterday, though I seem to have taken longer today to walk a shorter distance. I turned off or hid my timepieces last night and once I'd killed the pain in my shoulder I found the pitch of the tent to be one of the most comfortable ever. It had been light for a long time when I eventually gathered the momentum to produce a brew. The timepiece said 8 o'clock and I felt refreshed. 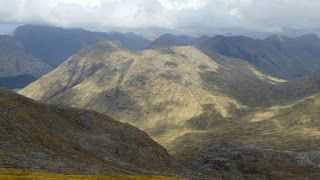 I started up Beinn Churalain soon after 9. Messages were received, contrasting from my daughter (a new and challenging job) and Alan R (who I was to meet tomorrow - possible tooth abscess - desperately seeking dentist). 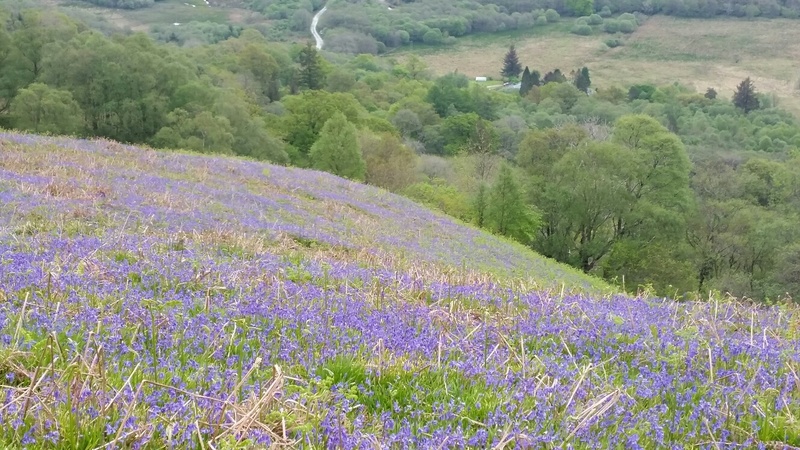 It was steep, with lots of Common Dog Violets, but with less water in my bag it was easier going than last night. I was alone with the grouse and the meadow pipits. Churalain is a nice peak with a large cairn and good views, albeit hazy today with the increasing cloud. My route took a north easterly direction along a rough 3 km ridge with lots of easily negotiated fences. Easy enough and with good views to the route ahead (pictured top), but the descent that followed was reminiscent of yesterday's antics on Airds Hill. Rough going through a forest. The clearings were bright blue with a magnificent display of bluebells. There were also orchids, wood sorrel, stitchworts, wild garlic, celandine, bugle, cuckoo flower and more. It took me three hours to cover the first 6 km of today's walk, so any hope of getting up Beinn Trilleachan was soon discarded. Its inclusion on my route plan was an erroneous last minute adjustment that blew apart my policy of a maximum of 25 km and 1000 metres ascent on a backpacking day. Otherwise I might still be walking far into the night instead of enjoying a good four hours at camp before the light goes and sleep beckons. After that 6 km of rough going, during which i tripped on a tussock and bent a walking pole, it was nice to have a short stretch of tarmac in Glen Creran on which to regain my composure. Two people, the first I'd seen today, were walking towards me. It's a small world. I knew them. 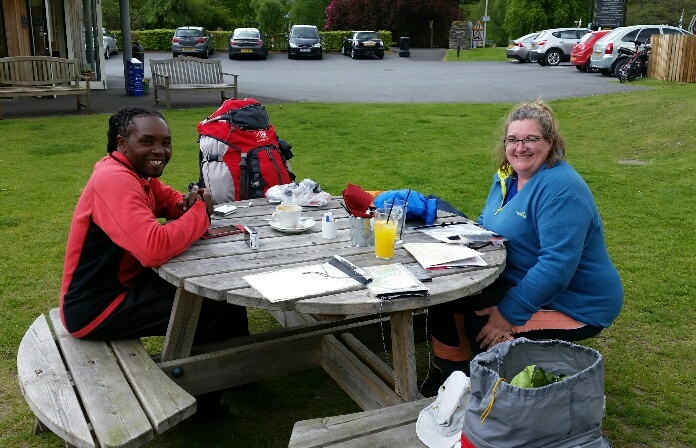 Les and Izzy are accomplished Challengers and erstwhile organisers of the Scottish reunion. They live in Appin and were out for a morning stroll. It was great to see them. They plan to make a guest appearance at some of the Challenge hot spots next week. The car park looked familiar. I think it was here that we assembled a few years ago to celebrate Jon and Martin's final Munro, Beinn Sgulaird. Lots of Aberdeen Hillwalkers, pre XXL days, were hanging around in full midge protection gear for Martin. The group set off and was eventually caught by Martin, who we thought should know the way. "You should have told me where to go" he complained "- I've never been here before!" It started to rain. I lunched under cover of some pine and beech trees just beyond Glenure, where the buildings are being renovated, or even rebuilt. A runner passed by. I met her later coming back down the good track that leads to Airigh nan Lochan. Waterproofs were donned over the t-shirt on the way up. It was warm and calm. It was from this Lochan that I should have turned off to ascend Beinn Trilleachan, an exceptionally rocky peak best known for the unique rock-climbing on its 'Etive Slabs'. The slabs - unavoidable even for walkers - would be slippery in the wet conditions. Dangerous. Anyway, it was already 2.30 and I didn't want a late finish. The next four km to Glen Etive were rough and slow. Some campervans were parked on the Glen Etive road. Alas not Mick and Gayle's. Rampant gorse is flourishing in the Glen. Rampant rhododendrons are being cut back. 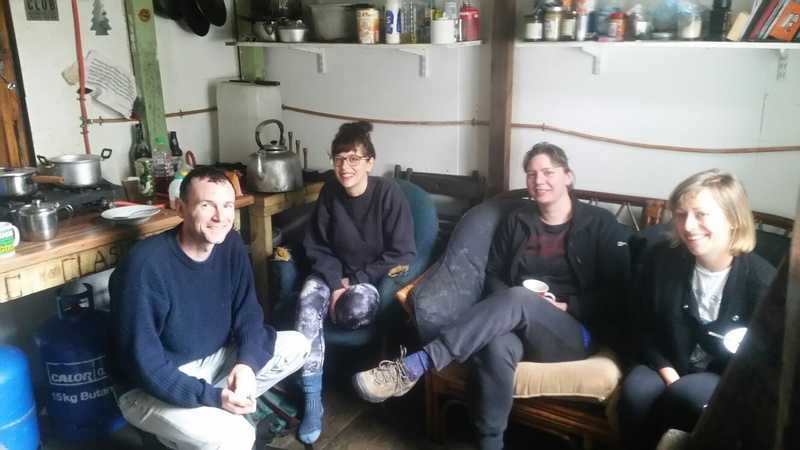 A small hut with a girdle of fancy cars announced itself as the 45° Mountaineering Club hut. 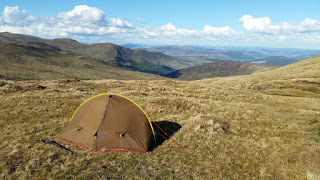 A review of contours had already led me to conclude that a lower than planned camping spot may make life flatter and easier. 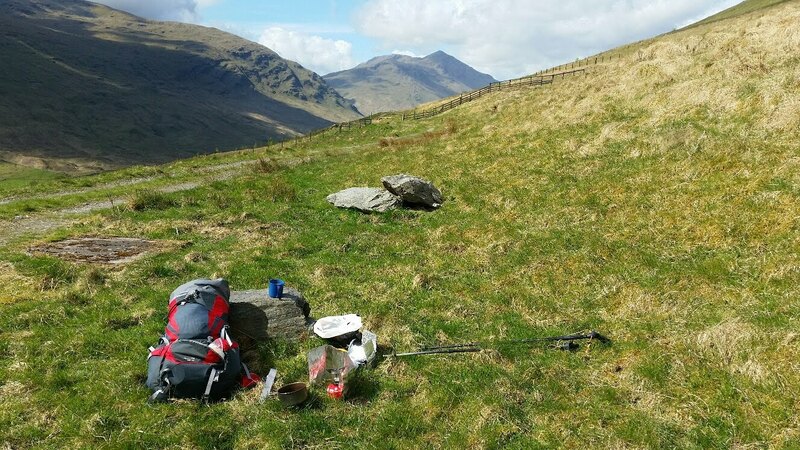 So soon after crossing the River Etive I stopped for water at a convenient stream and didn't have to carry it very far to this flat site not far from the river, at the foot of the path to the Robber's Waterfall, the pleasures of which I've postponed until tomorrow. Meanwhile I've enjoyed a full five course dinner. My appetite has returned. The pictures should be self explanatory. 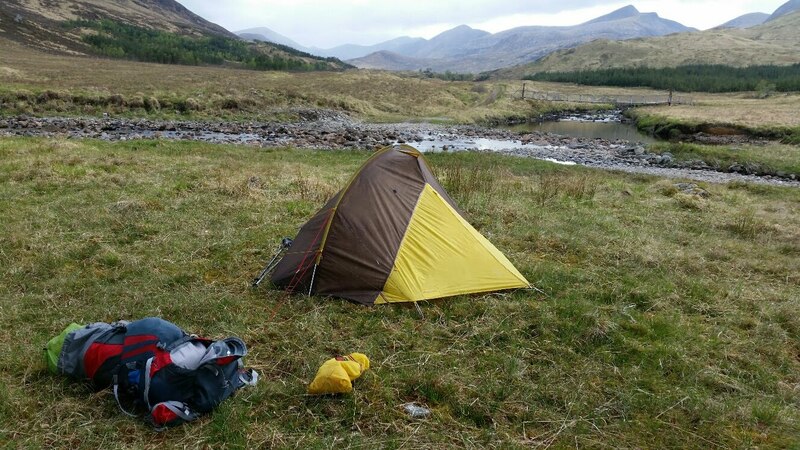 There's no phone signal in Glen Etive, so apologies for the delay.